Inclusiv is the new name of the National Federation of Community Development Credit Unions. 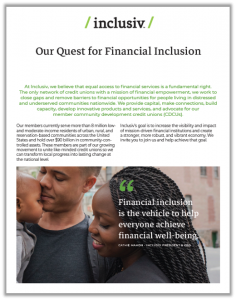 Inclusiv's mission is to help low- and moderate-income people and communities achieve financial independence through credit unions. At Inclusiv, we believe that true financial inclusion and empowerment is a fundamental right. We dedicate ourselves to closing the gaps and removing barriers to financial opportunities for people living in distressed and underserved communities. Inclusiv is a certified CDFI intermediary that transforms local progress into lasting national change. We provide capital, make connections, build capacity, develop innovative products and services and advocate for our member community development credit unions (CDCUs). Inclusiv members serve over eight million residents of low-income urban, rural and reservation-based communities across the US and hold over $92 billion in community-controlled assets. Founded in 1974, Inclusiv is headquartered in New York, NY, with offices in Madison, WI and Atlanta, GA.
Inclusiv develops and delivers innovative products focused on low-income consumers, fosters strategic partnerships, identifies best practices and lessons for serving underserved communities, and provides education and training to CDCU leaders. Inclusiv builds CDCUs’ capacity to serve low-income communities through technical assistance, webinars, practical tools and guides, and customized consulting services to support their growth and service to low-income communities. Inclusiv’s Inclusiv/Capital invests in member CDCUs to strengthen their financial position and expand their impact on the low-income communities they serve. Inclusiv investments are designed to help CDCUs to offer innovative and responsible loan products and help consumers to protect and build assets. Inclusiv advocates with government agencies, regulators and lawmakers for policies and programs that promote the safety and soundness of credit unions while allowing them to grow and promote the financial inclusion of low-income communities.